Agility is a fun activity where the animal's fitness and the handler's ability to train and direct the dog over and through obstacles are tested. It is fast, furious and a great favourite with dogs and handlers alike. We meet on private land in Iron Acton and train over jumps, dog walk, see saw, A frame tunnels and a hoop. Because all the work is off lead outdoors we need to be sure that all the dogs participating have a reasonable level of obedience training. We don’t train to competition standards but there is no reason why members shouldn’t go on to compete if they want to. 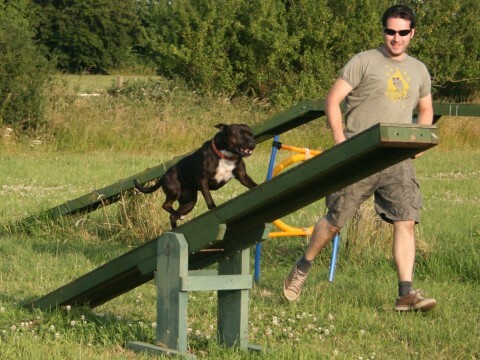 We have organised agility taster sessions at our local village fete and will be organising a fun competition in August as part of our club show day and BBQ. Membership is by invitation from our Monday classes and members pay a £6 annual membership fee and £4 per session.